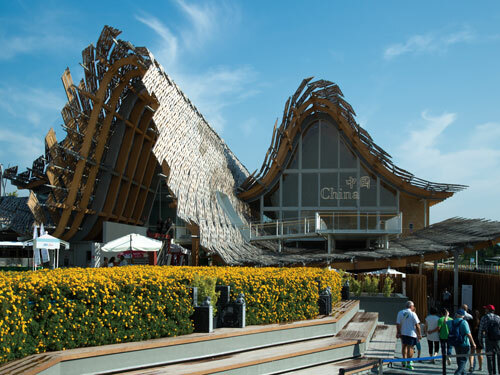 China's pavilion 'Land of Hope, Food for Life' unfurled over a large 4,590m2 venue under peaked roofs styled on traditional Chinese farm houses, and successfully showed the progress made by the nation in the supply of wholesome and sustainably produced food. China’s desire to maintain harmony between mankind and nature was demonstrated through three themed areas highlighting the cultural importance of food and onward to exciting advancements in cultivation, such as a new rice-hybrid plant. Bringing these ideas to life were groups of two and three Panasonic 1Chip DLP™ PT-FD605C (PT-DX610) projectors, vertically mounted on the ceiling and shooting down onto a variety of interactive tabletop surfaces. China also selected Panasonic’s outstandingly bright, flexible, and efficient LCD technology for both curved-wall and interactive-screen projection with the addition of four PT-SLX70C (PT-EX600) units.